Myfanwy’s writing has appeared in a wide range of publications. An eclectic sample of her works are to be found below. Historical Fiction Writing – A practical guide and tool-kit is now available. This is a practical guide and tool-kit with contributions from Professor Bernard Knight, and tips from over 50 professional historical novelists and experts in the fields of publishing, research and literature including Edmund Bohan, Barbara Cleverly, Bernard Cornwell, Lindsey Davis, Carola Dunn, Ariana Franklin,Tess Gerritsen, Susanna Gregory, Lilian Harry,C.C. Humphreys, Jane Jackson, Michael Jecks, Karen Maitland, Professor Glen Phillips, Harry Sidebottom, Julian Stockwin, Frank Tallis, Andrew Taylor, E.V. Thompson, Nicola Thorne and Jacqueline Winspear. 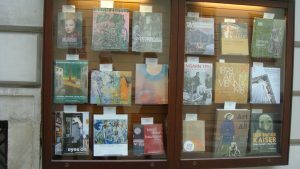 Ingrid J Kurnig’s 2016 Exhibition catalogue http://www.kurnig.com, which was published and on sale in Vienna, Austria . 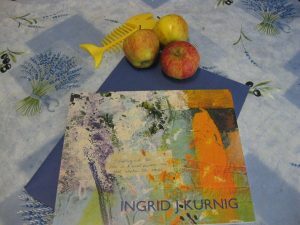 Myfanwy provided the creative words in English to compliment Ingrid Kurnig’s contemporary, inspiring and imaginative art. Myfanwy believes that everyone should have the opportunity to experiment with and enjoy creative writing and as a result has tried to enable these ‘voices’ to read with the the publication of 6 community anthologies of poetry and prose based on community based projects since 2000 including Poetry in the Pews, (https://quarryhouse.blog/2008/07/25/poetry-in-the-pews/) which includes 1,063 entries from over 10 different countries and The Waterloo Anthology (raising funds for project Hougoumont and which comprises entries from the UK,Germany and Belgium.